Austin Madden makes a heads up play by calling timeout after Ross Seitter dove for a loose ball, giving New Haven the final possession and a chance to force overtime. Hermann, Mo. – New Haven dropped their second straight and fifth loss in the last six games. Instead of falling to 9-9 after Saturday’s two-point loss to Montgomery County, New Haven could possibly be 12-6 if they could find away to win those close games. Despite three Shamrocks hitting double figures and Austin Madden’s game high 14 points, all caming in the first half, followed by Seth Schenck and Kyle Ruediger’s 12 points, Montgomery County slipped away with a 46-44 win in Saturday’s third place game. Alex Poggas finished with a team high 10 points in Thursday's semifinal against Chamois. Hermann, Mo. – Chamois erased New Haven’s 11-point halftime led, advancing into Saturday’s title game in the Hermann Boy’s Tournament, 37-34. Saturday will be just the third time Chamois has played for the championship after winning the tournament for the first time in 2005 by defeating the Shamrocks. After suffering an overtime loss last week, 31-24 to Chamois, New Haven looked to redeem themselves in Thursday’s semifinals. In Thursday’s semifinal New Haven busted out to an 11 point lead, 23-12, while holding Chamois to 12 first half points. The Shamrock defense held the Pirate’s two deadly shooters, Clay Nolte and Eli Strobel to a combined six points after Strobel lit up Hermann for 36 points. 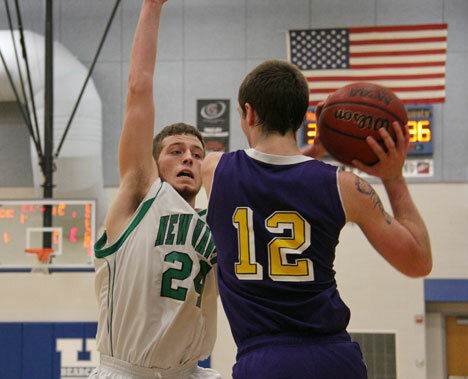 Kyle Ruediger returned to action scoring 12 points in New Haven's win over Owensville. Hermann, Mo. – Tuesday night Kyle Ruediger returned after missing the past three games since being injured in the semifinals at South Callaway two weeks ago. Since Ruediger’s injury New Haven had lost three straight as they entered Tuesday’s first round of the Hermann Tournament. Ruediger is not quite 100% as Coach Ray Steinhoff limited his playing time to about 25 minutes in New Haven’s win over Owensville, 48-35, advancing them into Thursday’s semifinals. 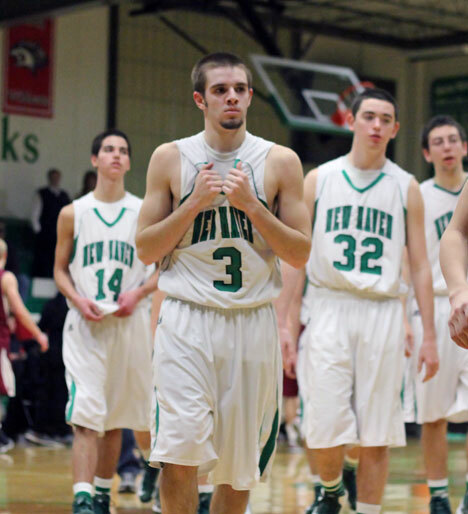 Austin Madden's expression summarizes New Haven's tough loss to Linn on Tuesday night. Injury update on Kyle Ruediger below. New Haven, Mo. – After coming out on fire, draining their first four shoots, Austin Madden hitting two straight threes to give New Haven a 10-0 lead. 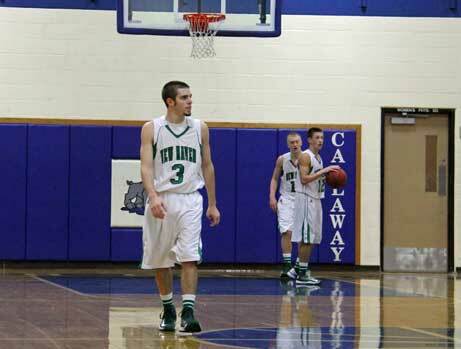 It seemed like Linn was in for a long night instead New Haven handed the Wildcats their eighth win of the season, 45-44. Despite New Haven giving up 13 offensive rebounds and lack of patience on offensive they still had put themselves in perfect position to sneak away with a win. Linn’s Jesse Wiggins dominated the boards, 12 of his game high 20 points coming from offensive rebounds as Linn out rebounded New Haven 28-16, 13 of them offensive boards. Photo from earlier in the game. 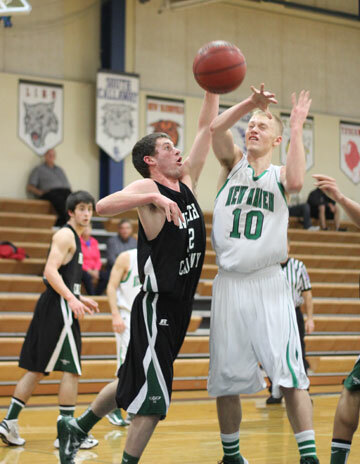 After New Haven’s win over North Callaway in Wednesday’s semifinal at the South Callaway Tournament, speculation arose concerning the foul by North Callaway’s Jacob Haubner on New Haven’s Kyle Ruediger and if it was an intentional foul or not. 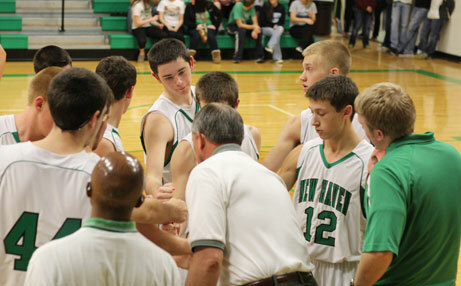 North Callaway called timeout after New Haven went on a 7-2 running, giving them their largest lead in the game, 40-31. Ruediger drove past Haubner, down the right side of the lane when Ruediger was knocked to the ground out of bounds, and had to be carried from the court. 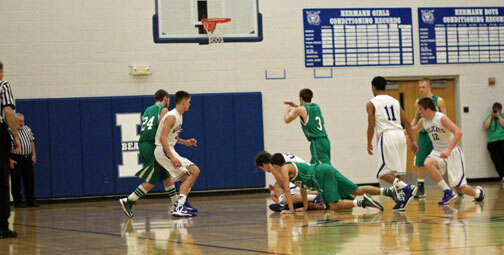 Haubner’s foul occurred in New Haven’s first possession immediately following the timeout. The assumption of an intentional foul was heightened after the comment made by North Callaway’s Head Coach Tim Turlington to Quick News’ Kyle Quick in our post-game interview. South Callaway, Mo. - Wednesday night, New Haven defeated North Callaway 47-43, advancing into Saturday’s Championship game; but without Kyle Ruedgier in the line-up. In a physical second half, Austin Madden was the first Shamrock knocked to the floor after taking a blow to the right side of his head. Madden was off the ball guarding his man and the next minute he was on the floor holding his head. Thursday morning, Coach Ray Steinhoff received good news and bad news after Wednesday night’s semifinal in the South Callaway Tournament. 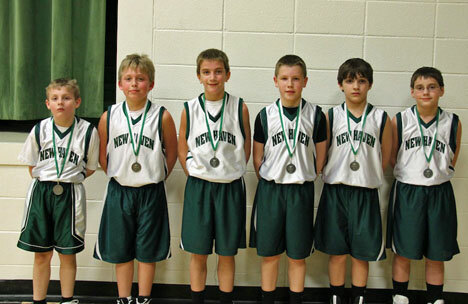 Pictured New Haven 5th Grade left to right: Dominic Lewis, Hunter Garran, Luke Gerlemann, Jay Eichelberger, Demitri Pataky, Keegan Huff, not pictured Coach Mark Laune and Jim Eichelberger and Matthew Laune out due to sickness. New Haven, Mo. – Sunday’s finals of New Haven’s 5th and 6th grade tournament hosted by the New Haven Athletic Boosters showcased several edge of your seat, heart pounding game endings. 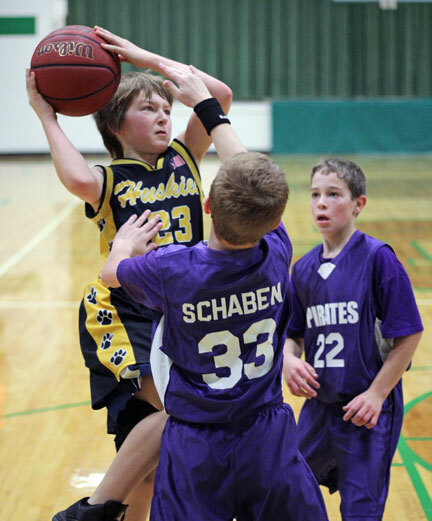 New Haven’s 6th grade began by beating Union in the first round on Saturday but fell short later that evening, placing them in Sunday’s third place game against Hermann. 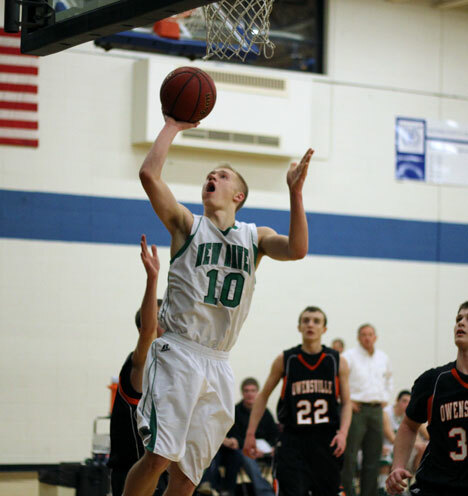 Seth Schenck drains one of his four three's on the night, finishing with 16 points. South Callaway, Mo. – New Haven erased any concern whether or not they would be game “speed” ready after not playing for over two weeks by jumping out to a 20-3 lead, rolling over New Bloomfield by 33 points, 68-35 advancing to Wednesday’s quarterfinals. Video of the dramatic finish below. New Haven, Mo. – Twenty-four minutes was not enough to decide Sunday’s third place game in the New Haven 6th grade tournament. The Chamois Pirates led by seven 27-20 with just under three minutes left in the fourth quarter when R-2 mounted a dramatic, which began with back-to-back three’s to pull with in one with 1:45 left on the clock. (27-26). Chamois answered to give themselves a three-point lead, 29-26, with less than one minute from taking home the third place trophy. There is nothing more exciting than watching young players make big time plays when the game is on the line. If it seems forever since the last time New Haven has played a game, that's because their last game was last year. 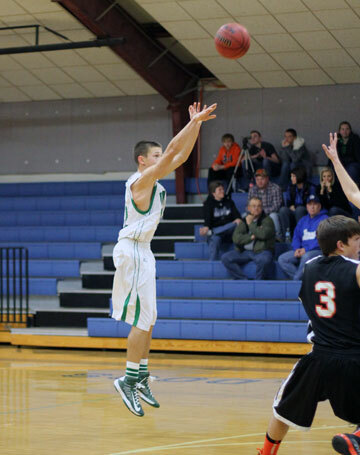 It will be 16 days on Monday since beating Silex on Dec. 21, 2012. New Haven would have played on Thursday at Bourbon but thanks to the snow that game was canceled. The South Callaway Tournament kicks off on Monday with the boys playing their first round games with the girls beginning on Tuesday.